Improve your dermatological diagnostic accuracy. The most efficient method in the diagnosis of skin diseases is the combined validation of clinical and histopathological features. The results of biopsy investigation in isolation don’t always yield answers. But when considered together, the clinical pattern and the histopathology, then diagnosis can become clearer. In this process the diagnostic impact of histopathology may be decisive or just confirmative to the clinical differential diagnosis. The structure of the book follows a basic approach to morphology, which is overall orientation at scanning magnification first, then identifying a prototypic pattern, and finally finding the essential diagnostic clue(s) under high power magnification. 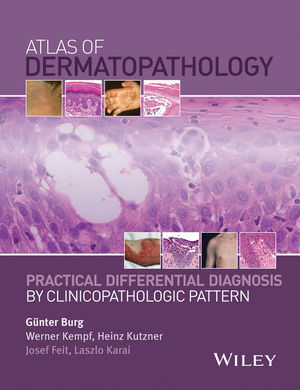 Dermatopathology: Practical Differential Diagnosis by Clinicopathologic Pattern provides top quality images to correlate clinical presentations with histopathologic features. Annotated images highlight subtle indications that can clinch the diagnosis. Concise, bullet-pointed text provides further context. Written by internationally renowned authors, the book is ideal for anyone involved in the diagnosis of skin disease.